Find out why MPLX, which has been growing like a weed, just slashed its payout growth forecast and what dividend investors should expect in the years to come. The worst oil crash in half a century has decimated almost all energy stocks, even midstream MLPs, whose tollbooth-like business models are supposed to insulated their cash flow from commodity prices. 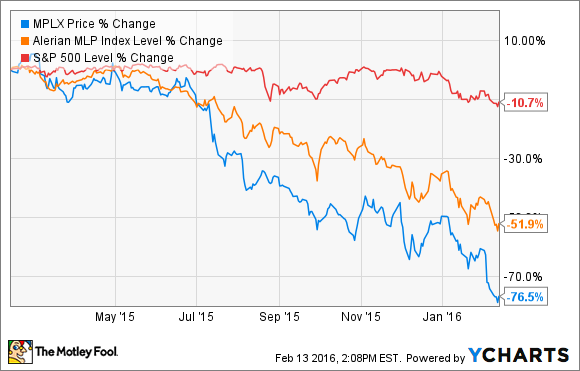 However, some MLPs, such as MPLX (NYSE: MPLX) have been battered far worse than their peers. MPLX closed its merger with MarkWest Energy Partners on Dec. 4, which explains the stupendous growth in its year-over-year results. However, given the greatly increased unit count from the acquisition, the company's coverage ratio wasn't as robust. Luckily, a coverage ratio of remains sustainable, despite the 10.9% yield that indicates Wall Street is pricing in a high risk of a payout cut. But if MPLX's distribution is reasonably safe, then what explains the market's recent routing of the unit price? Before the merger with MarkWest, MPLX was guiding for long-term distribution growth of approximately 25% per year, in line with the payout growth rate it has achieved since its IPO in 2014. However, management's announcement that it forecast only a 12% to 15% distribution increase in 2016 shocked investors and has resulted in a unit price collapse of as much as 25% since earnings were released on Feb. 3. Despite these solid results and a strong backlog of projects. The decision to cut guidance came down to two things: increased exposure to commodity volatility, and a much more leveraged balance sheet. In Q4, MPLX's pre-merger assets generated $243 million in DCF, while MarkWest resulted in negative-$16 million in distributable cash flow. This shortfall was due to low gas prices that have forced producers to rapidly cut back production. In turn, MarkWest's pipelines and gas processing volumes have suffered. In addition, MPLX is guiding for full-year 2016 DCF of between $970 million to $1.1 billion. The low end of guidance is nearly unchanged from the $972 million it generated in 2015. This indicates that management thinks MarkWest may not be a robust cash contributor this year. Still MPLX's 2016 DCF guidance results in an expected DCR of between 1.19 and 1.22. This indicates that, barring a continued slide in natural gas prices, the MLP should be able to sustainably achieve its payout growth target. As part of the merger, MPLX took on $4.1 billion of MarkWest debt, raising its leverage ratio (debt/EBITDA) from 3.1 to 4.7. Management's goal is to reduce that to 4.0 by year's end, which means its ability to finance aquisitions or drop-downs from Marathon Petroleum (NYSE: MPC) in 2016 through debt is severely limited.In fact, management has no plans to take on any additional debt this year. With its unit price trading at such low levels, it's cutting off its access to cheap equity capital. MPLX now faces a major short-term problem funding profitable growth. Marathon Petroleum Corp. is planning to drop down its inland marine business to MPLX in the second quarter, which is expected to boost the MLP's annual EBITDA by $120 million or 10.5%. However, given that Marathon Petroleum will be paid entirely in new MPLX equity, the MLP faces the same risk that the deal might dilute cash flow per unit and reduce its ability to grow its payout in the future. MPLX's merger with MarkWest Energy Partners has left its cash flows slightly more exposed to commodity prices and its balance sheet far more leveraged than before. With its access to growth capital now restricted by the collapse of the unit price, it's understandable and appropriate that management reduced its forecasted distribution growth rate. That being said, MPLX's distressed yield is pricing the MLP as if the payout were in danger of being cut, which, given the amount of cash coming in the door, isn't likely unless energy prices remain very low for several years. While MPLX is likely to remain a highly volatile MLP, appropriate only for investors with a high-risk tolerance, I remain confident that at today's undervalued price it is likely to make an excellent long-term income investment over the next five to 10 years.